There is a detailed historical record of freeze-up and breakup of lake, river, and sea ice in many communities, particularly where ship navigation and ice roads are dependent on ice conditions. These observations are local and they often reflect near-shore conditions, so they may not be representative of regional or synoptic conditions. These are nevertheless valuable in documenting changes in ice cover during the past century, particularly for river and lake ice. In many freshwater ice settings, local observations are simpler to interpret, as water masses are limited in extent, there is less multiyear memory, and interannual variability in winds, pressure patterns, and currents have a minor influence compared with their impact on sea-i ce conditions. Available river and lake records that are at least 150 years in length in the Northern Hemisphere point to shorter winters, with freeze-up occurring 8.7 ± 2.4 days later and breakup moving up by 9.8 ± 1.8 days over this 150-year period. Over a shorter time frame, the last 30 to 70 years, regional compilations of the freshwater ice season indicate a large degree of variability. For recent decades, visible and microwave satellite imagery offer good discrimination between open water and ice conditions. Regional variations in the ice season are broadly consistent with temperature changes, with observations pointing to a shortening of the ice season by roughly 10 days per °C of warming. Changes in the snowpack can cause deviations from this relationship with temperature. Arctic, expressed as anomalies from the monthly mean ice extent. This illustrates the decline that began in the early 1970s. There are fewer observations available in the Southern Hemisphere, but whaling vessel records and sea-salt indicators in Antarctic ice cores indicate that Antarctic sea-ice cover was more extensive in the 1950s than today. This is consistent with the possibility that longer-term declines in Antarctic sea ice have been arrested since the 1970s by regional cooling associated with ozone depletion. 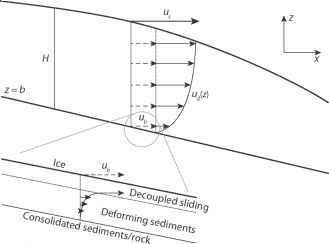 Ice thickness is more difficult to gauge than ice extent. Available evidence from upward-looking sonar imaging along submarine tracks indicates that the Arctic ice pack thinned by as much as 1.3 m, on average, from the 1950s to the 1990s. Satellite laser altimetry measurements of sea-ice draft have enabled estimates of ice thickness since the early 2000s (e.g., figure 5.2a). These records indicate that multiyear ice over the Arctic basin thinned from 3.6 to 1.9 m from 1980 to the late 2000s, but longer altimetry records are needed to assess what is typical for interannual and interdecadal variability in ice thickness. Basin-scale variations in ice thickness and extent should be broadly correlated, as both respond to changes in oceanic and atmospheric temperatures. 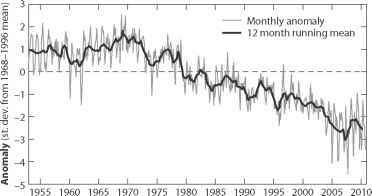 More open water (reduced ice extent) leads to warming of the ocean mixed layer and increased ice melt, hence thinner ice. This general correlation can break down on regional scales, as ice convergence (e.g., due to persistent onshore winds) can give compaction and ridging, leading to reduced ice extent but unusually thick, concentrated ice.